Given its resemblance in certain respects to that of the 95th, the “rifles” pattern dress of the 2nd Light Battalion seems fairly straightforward. Even so, there are some features that call for a second look, and some of this gets a bit involved. In addition, the Meyer ledger (thanks to Meyer & Mortimer and Ben Townsend for images) sheds light on some of the more marginal aspects of officers’ wear. Some aspects can be considered in relation to the dress of the 1st Battalion – see page 3. Click to enlarge images. For once, the Beamish plate is relatively clear. The dark green jacket with black collar, cuffs, straps and tufts, with three rows of white buttons, is essentially that of the 95th, though no white feathering is visible here to the collar and cuffs. The cap has an unusual round pompon, and cap cords and a bugle are visible. Though a line close to the crown of the cap can be seen, there is no clear evidence of the leather reinforcement to crown and band shown in later interpretations, and no such reinforcement appears in the figure in the Beamish Centrepiece. The trousers appear a very dark shade of grey, considerably darker than those of the 1st Battalion in the corresponding plate. 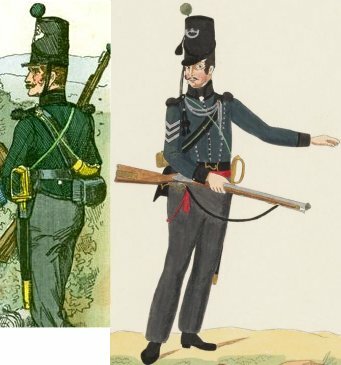 The tone of the trousers in the image is pretty much the same as that of the collar, cuffs and black gaiters; given the evidence below that officers’ pantaloons and overalls were routinely described as “black”, it’s my suggestion that the trousers of the other ranks were also black, up to the late point where the other ranks’ dress of the two light battalions appears to have been harmonised. 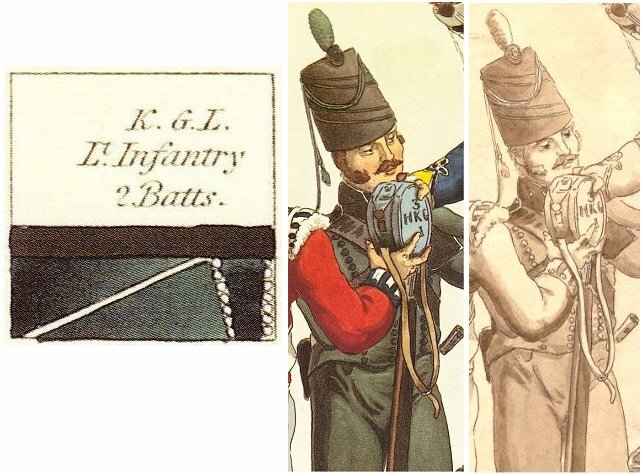 Evidence for this appears by 1815 in Hamilton Smith’s chart and plate, generically captioned “Light Infantry”; these show both battalions in a “rifles” jacket with black collar, cuffs and straps feathered in white, and no turnbacks. Interestingly, a single button is shown on the collar, not too obvious in the plate, but perfectly distinct in the preparatory drawing. Trousers are now dark green, not black or grey, worn over black gaiters. As the figure in the plate is not a rifleman, both pouch belt and bayonet belt are worn, with a socket bayonet. The headwear is particularly interesting, being a peakless cap with a cockade with a small bugle, a green tuft & green cords. As this is similar in style to the officer’s cap of the 2nd (see below), this has been taken as an indication that the figure is intended for a man of this battalion only. 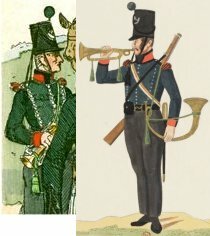 However it seems feasible to me that the similarity of dress between the men of the two battalions also now extended to headwear. 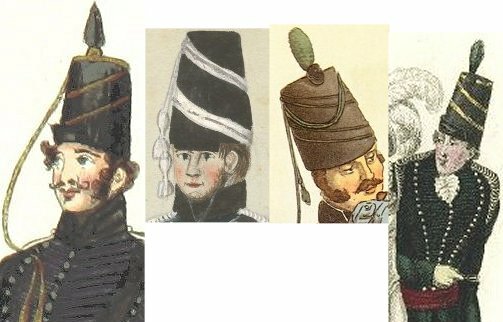 Mike Chappell dates the green trousers and peakless cap to 1809, and asserts that this cap is “the standard light infantry shako worn without a peak”; once again, I’m not sure what the basis might be for these statements. Knötel’s plate in his Vol III stays close to his immediate source in Beamish, though with black braid edging the collar, and with trousers that are at most a darkish grey. In his later plate in Vol XV the caps now seem a little elongated, and the tops and bands are clearly reinforced. The jacket now has two breast pockets with buttons, and shows black braid round the collar, cuffs and jacket edges, with no turnbacks but short rounded skirts with two buttons at the rear hips – apparently a sort of compromise between a dolman and a jacket. The trousers are now a mid grey. As usual, it’s hard to know which of these introductions may have any basis in evidence. An Aerts figure of a sergeant in the album at the Bibliothèque Nationale shows the trousers as dark grey and the black cuffs as round, rather than pointed; without any sources given for this, we have to assume that this is simply derived from Knötel. At this point it’s also worth noting that von Pivka’s figure, while otherwise more or less consistent with previous versions, wears the black rolled wings of the 1st Battalion – a clear error – and that Bryan Fosten, in his 1982 Osprey Wellington’s Infantry 2, inserts a “2” in the cap bugle, as he does a “1” for the 1st Battalion. Bugler by Knötel and Aerts – but on what basis? For a discussion of the pattern of greatcoats issued, or not issued, to the men of the Legion’s infantry, see page 2 on the Line Battalions. For modern portrayals of undress caps and jackets supposedly common to the two battalions, see page 3 on the 1st Light Battalion. Knötel’s later plate introduces a bugler, distinguished by red collar and cuffs, and black and red rolled wings. This image passes on to the Aerts album at the Bibliothèque Nationale, and then to Chappell, who uses it twice. Again, it would be interesting to know what the original basis for this might be, and if it is anything more than a reasoned guess by Knötel. The Beamish plate shows a dark green dolman or skirtless jacket, with three rows of buttons with loops, black collar & cuffs, with a double line of edging on the collar, and the suggestion of a loop on the cuffs. Clearly visible are narrow shoulder straps held by a ball button at the collar. To this, Knötel’s plate in Vol XV adds vague renditions of more elaborate braiding on the collar, cuffs and side seams. Fortunately, we don’t have to speculate about these details, as the Stothard “Rigementals” notebook includes a tailor’s drawing of an officer’s jacket, while the Meyer ledger provides a few additional details. The Stothard drawing is dated February 1813, though the jacket may date from a year or two previous to this. Meyer’s orders for this battalion include eleven such jackets and materials for two more, from 1809 to 1814; earlier jackets would not have been of this exact pattern. The overall look is comparable to officers’ jackets of the 95th. The jacket is of superfine dark green cloth, with black Manchester velvet collar and cuffs. It is edged all round (not obvious from the drawing) with black twist or “royal” cord, and looped and ornamented on collar, cuffs, side seams, hips and pocket with the same. The shoulder strap appears to be a double cord held by the button at the collar and running to the sixth outer button. Stothard’s drawing shows three rows of buttons on 21 loops. The Meyer entries make it clear that the central, functional buttons were ball buttons (silver plated) and the two outer, decorative rows half ball. If the drawing of 21 loops is accurate, a full allowance of buttons, allowing for the shoulder straps, would be 23 ball and 42 half ball per jacket. An order in Meyer of 1810 for materials for a jacket specifies two dozen ball buttons, five dozen half ball and 40 yards of cord; these totals might include a small allowance for spare. Stothard also includes a scale drawing of the “Hungarian” knot and ornamentation on and above the cuff; this is all cord, with no figuring braid used. A Meyer jacket of 1809 is stated to be lined in black calico, while the Stothard notes mention black cotton lining for the pockets. 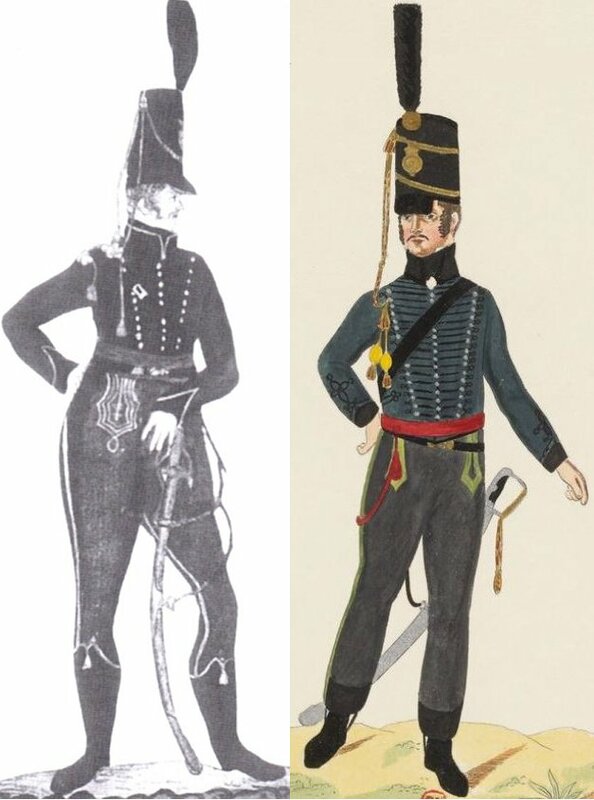 This jacket is shown with unusual accuracy in an Aerts watercolour of an officer of the Second [right] in the album at the Bibliothèque Nationale in Paris, though no sources for the image are given. Other aspects of the figure are discussed below. Hofschröer’s 1989 Osprey includes a “puzzling” contemporary image [right] held by the Bomann Museum at Celle, said to be of an officer of the 1st Battalion in 1812, though how firm that identification might be is not clear. Hofschröer’s comments suggest with reason that it appears “closer” to the 2nd. It shows three rows of buttons on the jacket with black collar and cuffs edged in white or silver; black breast loops cannot be seen in the Osprey’s black and white reproduction, which is far from clear, but Mike Chappell later includes them in his plate based on this image. If this is an officer of the 2nd, it may represent an earlier form of the jacket. Other aspects of this image are discussed below. If the officer’s uniform was elaborate, no element has been more elaborated upon than the cap. The Bomann image shows an orthodox (if elongated) rifles cap with gold cords; no reinforcements at crown or base are visible, but Chappell puts them into his plate based on this image. (See the discussion of the 1st Battalion on page 3.) The Beamish plate shows a cap with a pointed plume, without bugle and with a squared folding peak. A long gold cord, or possibly two separated cords, is wound round it diagonally, and a gold line around the crown may be meant to indicate the continuation of this. What appears as a single cord hangs from the crown, dividing into two tassels on the chest. The cockade is also gold. Aerts’s figure [above right] seems to draw from both these sources, combining the folding peak with the Bomann cap plate, interpreted by Aerts as a crowned garter. The other obvious point of comparison is the peakless cap of the other ranks as shown by Hamilton Smith and discussed above. However, in all these cases the diagonal of the cords is shown as running opposite to that in the Beamish image. So far, so good. Our primary sources beg a number of questions about this cap, but there is a degree of coherence. The real confusion begins with what Knötel makes of it in his plate of Vol XV. Here the cap has blossomed into a peaked mirliton or flügelmütze, with a wrap-around “wing”, lined in white. (Why white? To match the silver of the jacket buttons?) While in Beamish the diagonal of the wing edges follows that of the cords, Knötel’s gold cords, looped from the back of the cap to the top right, are made to travel in the opposite direction. The cockade is now black, and Knötel gives it a small silver bugle. Knötel; Chappell; Fosten – problematic! To my mind, this is problematic: the squared retractable peak is a feature of some officers’ caps of the 95th and others, while the peakless mirliton is a familiar light cavalry item. But I’ve not yet spotted a composite peaked mirliton in use elsewhere that might have served as a model for what Knötel claims was worn by the 2nd. (On the other hand, I’m ignorant of the dress of the continental armies, and others may know better.) Did Knötel simply take his cue from the diagonal cord lines in Beamish and extrapolate the rest? Or did he have access to a surviving example, or to a clear contemporary image? Whatever its origins, the aesthetic appeal of Knötel’s mirliton has guaranteed its survival, and Mike Chappell provides a particularly convincing drawing of it in his first Osprey volume. Bryan Fosten describes it as with gold and crimson cords, the white side of the wing being of silk and edged in black, the black side edged in gold and showing on the front a “gold, circular crowned badge”. In Fosten’s image, this badge is placed near the top of the front, and not at the base as in comparable British light dragoon mirlitons. However, both Fosten and Chappell contradict Beamish and Knötel by reversing the diagonal travel of the wing, and having the cap lines running parallel with it. Either there are good primary sources for this cap that I’ve not yet discovered, or we’re dealing with a cumulative series of imaginative fabrications. I can’t help but suspect the latter, though I’d be very happy to be proved wrong. The Meyer ledger contains twelve orders for waistcoats between 1809 and 1814. Eight of these are of black cassimere, matching the colour of the legwear, as discussed below. The other four are of white, either cassimere or Marcella (a cotton fabric with a geometric weave, also called “quilted”). Of the black examples, three have three rows of plated buttons, echoing the jacket, but without braid, while another has three rows of “twist” buttons, looped with black figuring braid. A white cassimere waistcoat has three rows of plated buttons, a white Marcella three rows of “thread” buttons, neither with braid. While officers exercised personal choices over an item that was not designed to be viewed, such choices clearly lay within the parameters of appropriate regimental colour and style. 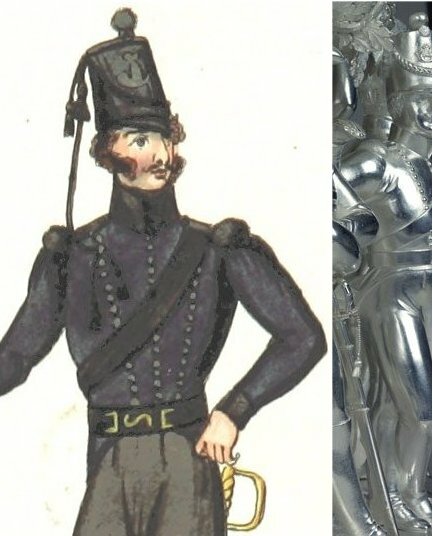 The Beamish plate shows the same dark tone of grey for the officer’s trousers as noted above for the other ranks; my assertion, in the light of the pantaloons and overalls discussed below, is that this is intended for black, but Knötel and his successors wilfully lighten it to fifty shades of grey. Beamish shows no trouser stripe, but a silver stripe appears in Knötel’s earlier plate, developed into a double stripe in his later version. 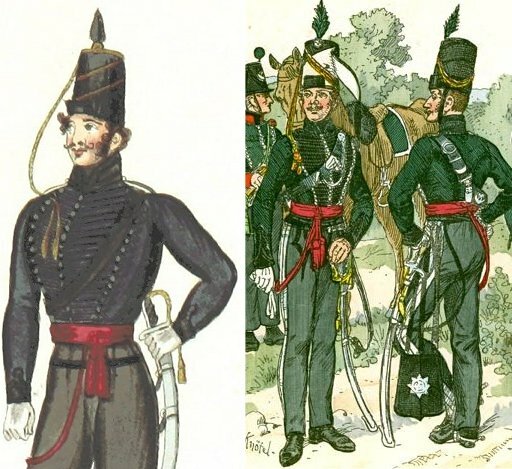 Between 1809 and 1814 Meyer’s orders for this battalion include 17 pairs of pantaloons that appear military in character. All are in black. Of these, 15 are of black stocking, the majority described as of eight thread stocking, others as of six thread, of “patent” stocking or of silk, and all 15 as decorated with black silk royal cord. One pair is of black cassimere, strapped with the same. (“Strapping” here means reinforcement down the inside legs.) One pair is probably black, decorated with gold lace; this is for a Paymaster, so may reflect a deviation considered appropriate to staff. The Bomann image [above] shows pantaloons in a dark tone with ornate knots on the flaps and seam stripes, apparently in silver. An odd feature is an additional seam stripe down the inside of the leg. Chappell’s reconstruction of this figure shows the pantaloons in the same dark green as the jacket, but I wonder if they were intended as black. The silver trim is not confirmed by any other source, which makes the image problematic. Meyer also has entries for ten pairs of overalls between 1810 and 1814. Again, black is the default colour; eight are in black, five noted as of second cloth with Japanned leather cuffs, of which three are strapped with the same black cloth, two not strapped. (Here “cuffs” means the leather reinforcements around the bottom of the legs.) Some are with and some without chains under the foot. One is noted as “made like breeches at the top”, another “with flies”. One pair of 1810, strapped with black cloth and cuffed with black leather, uses ten “regimental” buttons and 40 plain plated buttons. This pair has flies, so I assume, maybe wrongly, that five “regimental” buttons were used on each flap, and plain plated buttons down each leg fly. This pair is no more expensive than the others, so it is not clear how many of these overalls were buttoned down the sides, or if this one is the exception. As with waistcoats, officers clearly exercised some personal preferences within a general battalion style. There is no mention of coloured stripes for any of these black overalls. The two exceptions here are for “mixed” (grey) overalls, both for a Paymaster in 1814, so again perhaps an allowed staff variation. One pair is described as strapped with the same grey cloth and the other as having green stripes. The Aerts image [above] shows dark green overalls with a gold seam stripe, simplified gold knots and black cuffing. It’s possible that this represents dome sort of extrapolation from the Bomann image [above], translating the pantaloons into approximately equivalent overalls. Or there may be another source behind this feature, unknown to me. Without the benefit of any references by Aerts, it’s impossible to say. Fosten’s 1982 image of an officer, with the mirliton discussed above, though with the jacket accurately shown, wears light grey overalls striped and ornamented green, with black cuffing. These appear to be borrowed from the von Röder image discussed on page 3, which I identify as an officer of the 1st Battalion. With the exception of the Paymaster’s examples just mentioned, all the Meyer references to overalls are for black cloth. These were entirely without regulation but sometimes related to uniform colours. The Meyer ledger has one example, for Lieutenant Colonel Martin in 1811. This, like the jacket, is of superfine green cloth, lined with calico, with black velvet “round the bottom” (presumably as a band), and with a tassel. The Meyer ledger has eleven orders from 1809 to 1814 for greatcoats or “pelisses”. Nine of these, as seen for the 1st Battalion on page 3, are of superfine green cloth, seven of which are noted as having “regimental” buttons; whether this means a single row, or three rows as on the jacket and some waistcoats, is not clear. None of these coats are the “regulation” grey. Seven of the green coats are modestly priced, so probably plain or simply ornamented. Six of these have linen sleeve linings; the seventh has black silk at a small extra cost. Two items of 1814 are described only as “pelisses”, but are priced the same as a more expensive greatcoat of that year, and appear to be long top coats rather than a short hussar pelisse. One rather more expensive greatcoat of 1810 gives us some idea of the ornamentation available in the top end range, involving 14 yards of French braid, four yards of figuring braid, six tassels, 16 olives, fringe and silk sleeve lining. All of this was presumably in black. It’s impossible to be certain how these items were applied, but a reasonable hypothesis might be for 16 French braid loops on the front, fastening with olives, “Polonaise” hips in French braid with fringe and three tassels on each hip, and perhaps French braid on the side seams. The figuring braid might have ornamented the collar and cuffs. In his later plate, Knötel develops the Beamish figure by adding silver furniture to the belt. This seems fair enough, and is backed by the von Röder image. He also provides a sabretache for a mounted officer, apparently ornamented with a silver garter star. I’m not aware what the basis for this might be.